Sure, Skyrim: Special Edition has all the newest graphics and mod support, but if you want to experience The Elder Scrolls the way it was meant to be experienced - buggy, and starring like, six voice actors total - you need to pop in your copy of The Elder Scrolls 4: Oblivion. And if you own an Xbox One, you can do that without switching consoles, because it's now backwards compatible. 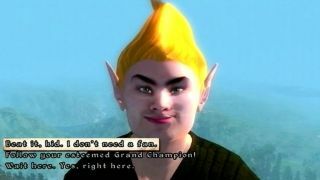 For those who missed out the first time around, I'd liken Oblivion to the Elder Scrolls series' awkward teen phase, where it was clearly trying to grow into something big and beautiful but just wasn't quite there yet. The controls on console are janky and stiff (though at least better than Morrowind on the original Xbox), NPCs look just… horrifying, and there's not nearly as much to do as in Bethesda's more recent offering. That said, it's also a unique setting within the Elder Scrolls universe, the story is pretty interesting (and stars both Patrick Stewart and Sean Bean), the Dark Brotherhood questline is still so, so good, and … hey, did you just take an apple that doesn't belong to you?? STOP RIGHT THERE, CRIMINAL SCUM! !